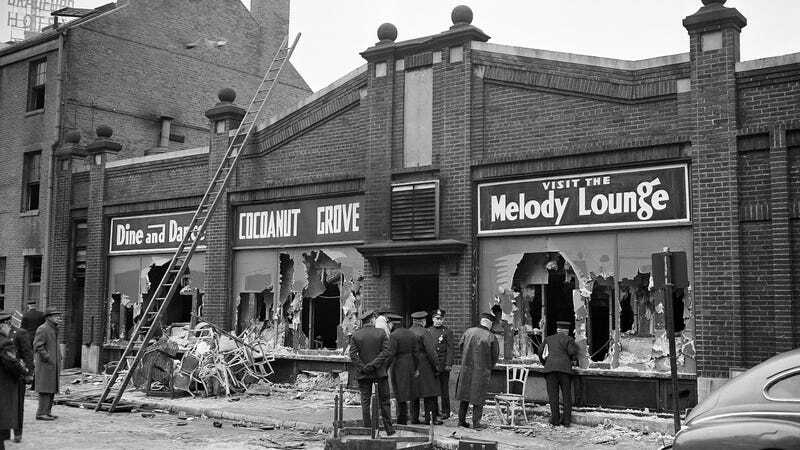 Today is the 75th anniversary of the infamous Cocoanut Grove nightclub fire, which ripped through the packed hotspot in minutes and ultimately killed 492 people. It’s responsible for many of the fire prevention measures that we take for granted today. The first flames broke out in a basement portion of the club, known as the Melody Lounge. From there, the fire rushed through the lounge and above the heads of people trying to race up a stairway, which acted as a chimney. A side exit door and a second door that opened onto a neighboring alley were locked. Minutes after the first flames were seen in the lounge, the fire had reached the street floor lobby. The club was plunged into darkness when the lights went out, adding to the panic. A few people managed to escape before the front door became jammed, trapping hundreds. In a 1992 piece (via Boston.com), the Globe pointed out that the venue was at least 25 percent over its legal capacity—just one among a slew of factors that contributed to the disaster, like locked doors and flammable decorations. One consequence was advancements in treatments for burns and smoke inhalation. But perhaps the most important impact was a greater attention to the importance of fire prevention, inspiring stricter fire codes and enforcement. For instance, you’ve probably noticed—without making much of it—that revolving doors often have regular doors on either side. That’s because so many people were trapped at the Cocoanut Grove fire. The anniversary is an important reminder that lots of red tape exists for very, very good reasons. “We have to make sure we are vigilant and follow those codes because they are based on experiences that we have gained sadly through tragedies like the Cocoanut Grove,” said Massachusetts Fire Marshal Peter Ostroskey. And while it’s easy to picture such a terrible event as purely a curiosity from the archives—the sort of thing that happens in history books—more modern disasters like the Oakland Ghost Ship fire quickly corroborate the danger.